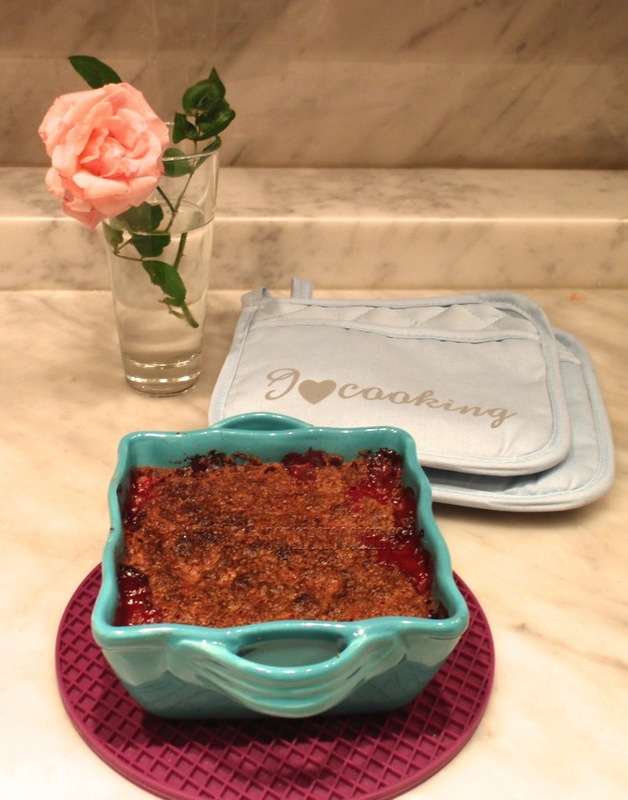 Spelt red currant rhubarb crumble + video! This lovely vegan spelt crumble is PURE DELICOUSNESS, I assure you! How I made it, you can watch on this video below: It is super easy too! 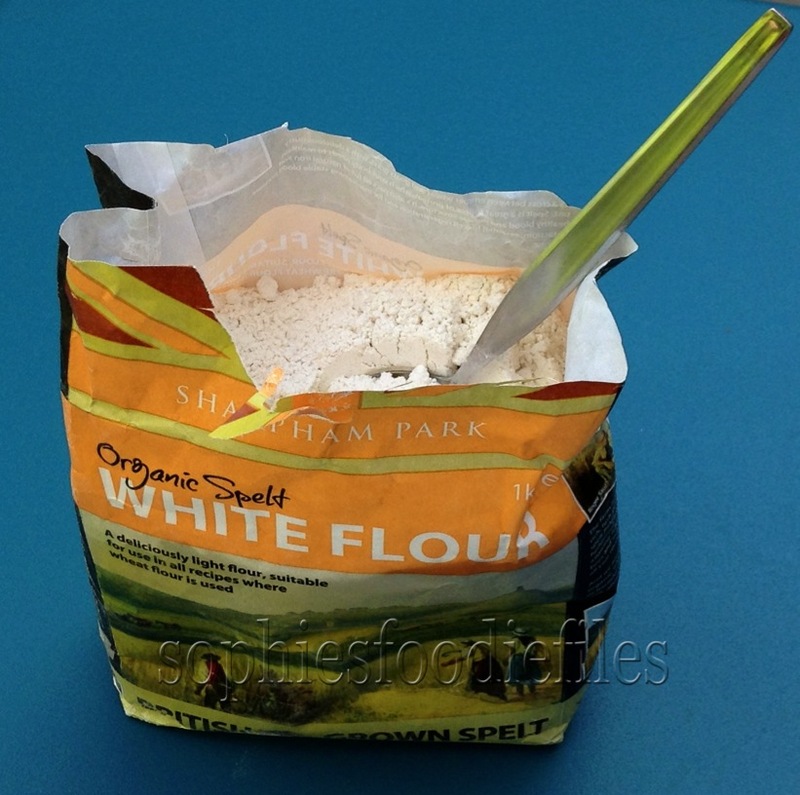 🙂 If you don’t have sprouted wholemeal spelt flour, use normal wholemeal spelt flour! Enjoy!!!! I had 2 of these yummy lovely filled blue ramekins! That is just enough for 8 persons! Read on for the cool video & recipe! Recipe: for 8 persons, a normal part. First, make your crumble topping. Take a fitted bowl & add spelt flour, cubed vegan butter & coconut sugar. With your hands, mix everything together until it looks like breadcrumbs, bigger & smaller one’s. Set aside or place into the fridge if it is too warm in your kitchen. Preheat your oven to 200°C (400 F) for 10 minutes. Now, make your mixed fruit base. In a fitted cooking pot, add your rhubarb pieces, ginger, coconut sugar & water. Mix well with a spoon. Simmer until your rhubarb pieces soften & you can pierce a fork through them. Carefully mix everything together & watch closely. The coconut sugar with water forms a caramel texture & you don’t want to burn it. Stirr often. Lower your heat if you need too. Turn heat off & finally, add your red currants stir them carefully through the rhubarb mix. Spoon them over into a fitted oven dish. I used 2 blue medium-large ceramic oven dishes. Divide your base mixture over the 2 ceramic dishes. 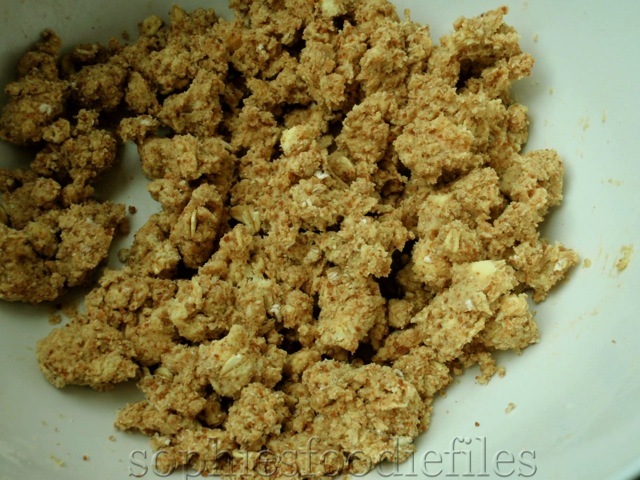 Take your crumble topping out of the fridge & divide into 2 equal portions. scatter them all over the fruit bases. Now, place into the hot oven on a lower shelf & bake for about 20 minutes. Check often because the coconut sugar in the topping can burn easily & you won’t want that! 😉 Lower the heat of your oven if you need to. After 20 minutes, your crumbles will be bubbling, ready & when you open your oven door, your house will smell amazing! With oven gloves on, take your dishes out of the hot oven. Leave them on your kitchen counter for about 10 minutes before serving & enjoy just like that or with some good vegan custard on the side: double yum! I assure you that you want a second serving!! I stocked away a lot of veggies & fruits in my freezer from our allotment harvest last year & needed to use up the last of the fresh strawberries that we froze last June. I thought, let’s use them into a nice home-made vegan strawberry crumble & so I did. Check it all out here! I served it with a good pouring hot or cold vegan or non-vegan custard. Yum Yum Yum! My strawberries were very sweet on their own, so I didn’t need a lot of coconut sugar to use in my crumble. 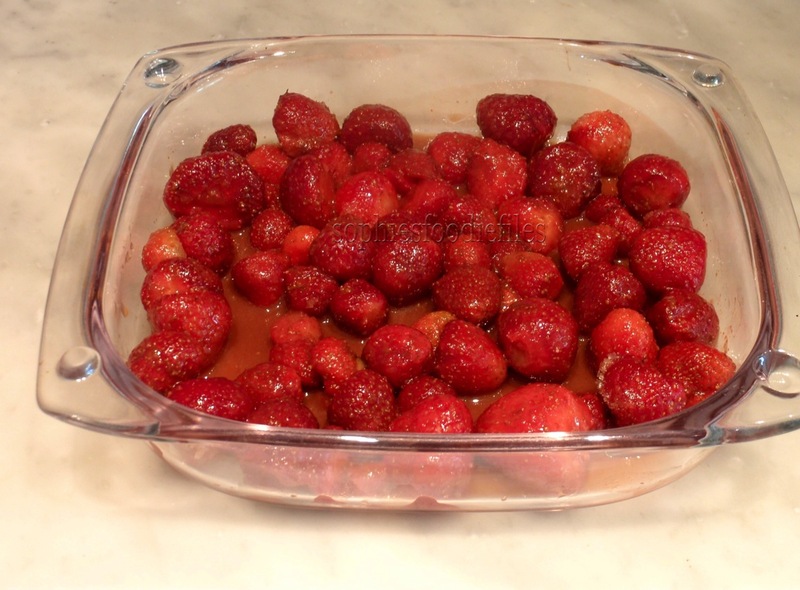 My strawberries crumble, my home-grown strawberries are a variety that are very sweet. So really, you don’t need the added custard,…but it is so delicious with it,…So over here in our household, we always eat custard with our home-made crumbles,…every time again! Ice-cream doesn’t do it for us, really! Preheat your oven to 200°C ( 392 F) for 10 minutes. I always use a fan oven. Now, place it all into your oven dish, evenly spread out. Place your crumble topping over the top & place in the bottom of the oven & bake for about 20 minutes. After 15 minutes, I lowered my oven temperature to 180 °C (356F ) & baked it for a further 5 minutes. This is because of the caramelization of the coconut sugar, you don’t want it to burn & turn black!!!!! Take your oven dish out of the hot oven & place on your kitchen counter for about 5 minutes or until you can eat it. I served mine with cold non-vegan custard. Rhubarb & yellow raspberry crumble, using 2 fruits from our allotment! Today, I went to our allotment. I needed to harvest many yellow raspberries & some of the latest rhubarb stalks. 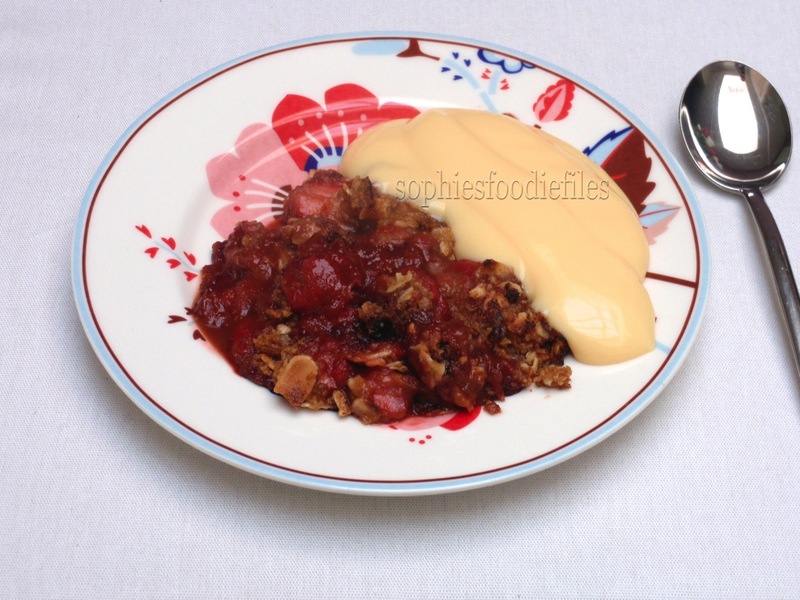 This is what I created with our lovely fruits,…Of course, a lovely vegan crumble! yes, yes! 🙂 I served it with some good hot pouring custard. To make it completely vegan, use vegan custard! 😉 You can make it gluten-free by using gluten-free whole oat flour! Hot crumble coming out of the oven! Rhubarb & red currant spelt crumble! All home grown! Do you also love what you see? Join me for some hot crumble fresh from the oven. I added some nice good COLD custard with it. Why? Because it was 35°C outside. You see what I mean? The yummy crumble filling is not too sweet either because you can & must taste a hint of fresh ripe red currants from time to time. They are not sour though. That is what you want. There is a nice flavor of ginger with the rhubarb & red currants. 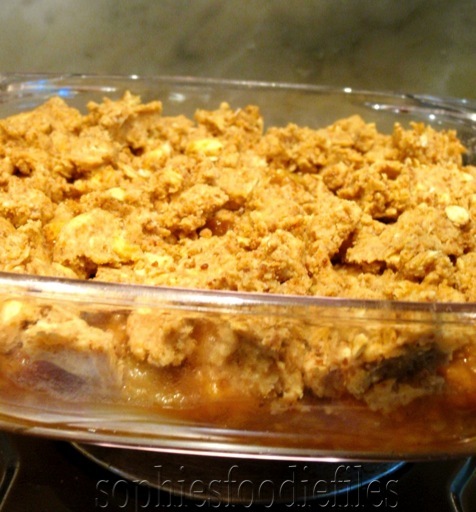 You can also taste a hint of cinnamon in this lovely crumble. The cold custard with it is just perfect! 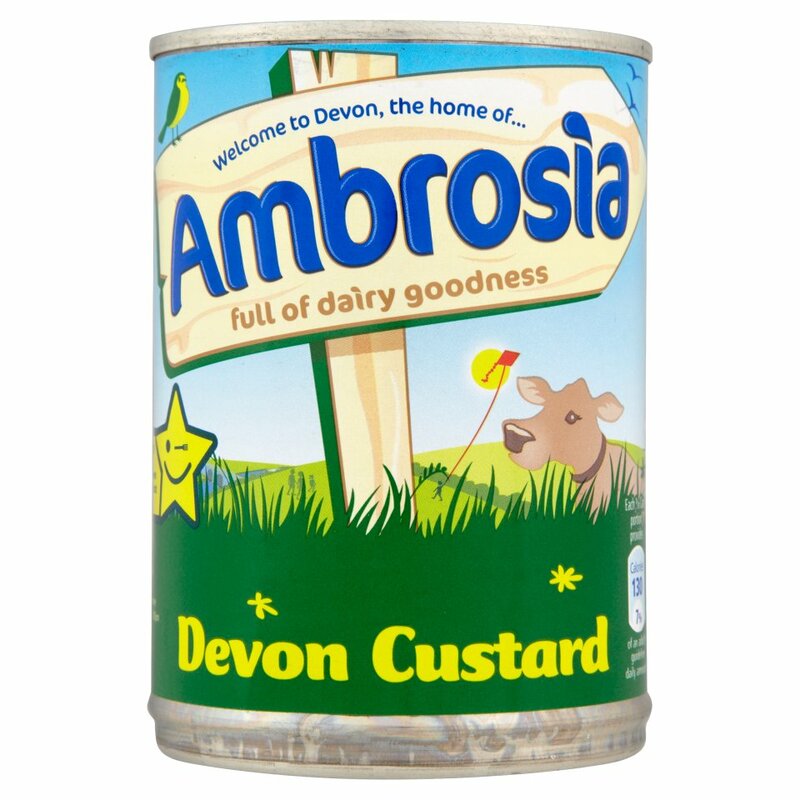 🙂 I used Devon dairy-full custard here, but to make it completely vegan use a vegan coconut milk or soy milk custard. MMM,….I can assure you! We have another big serving for us waiting until tonight! 🙂 ooh yes! 1. Prepare your rhubarb mix. Take a medium cooking pot & add rhubarb pieces, ginger, cinnamon, coconut sugar & 3 tablespoons of water. 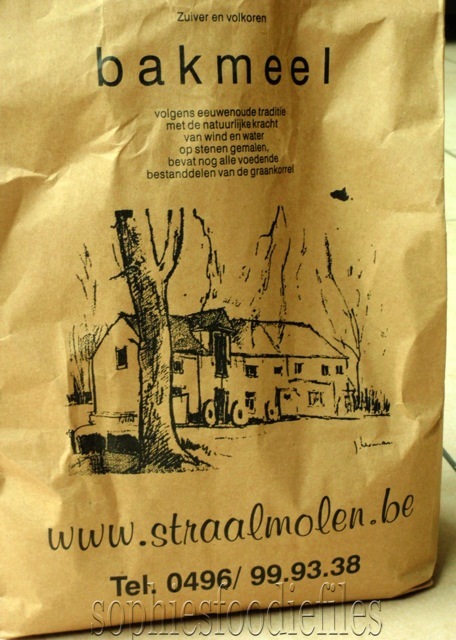 Stir. On low heat, stew the rhubarb mix until the rhubarb is nearly soft. This will take only max 5 minutes. Lower the heat if you need to. You don’t want the rhubarb to be completely soft! You still want a bite in that rhubarb! Now, add the red currants & stir it all through. 2. Preheat your oven to 200° C for 10 minutes. Make your crumble topping. Take a medium bowl & add white spelt flour, coconut sugar & knobs of margarine. With clean hands, mingle everything together until it resembles crumbles, bigger & smaller ones. Take a fitted oven dish & pour your mixed filling in to it. 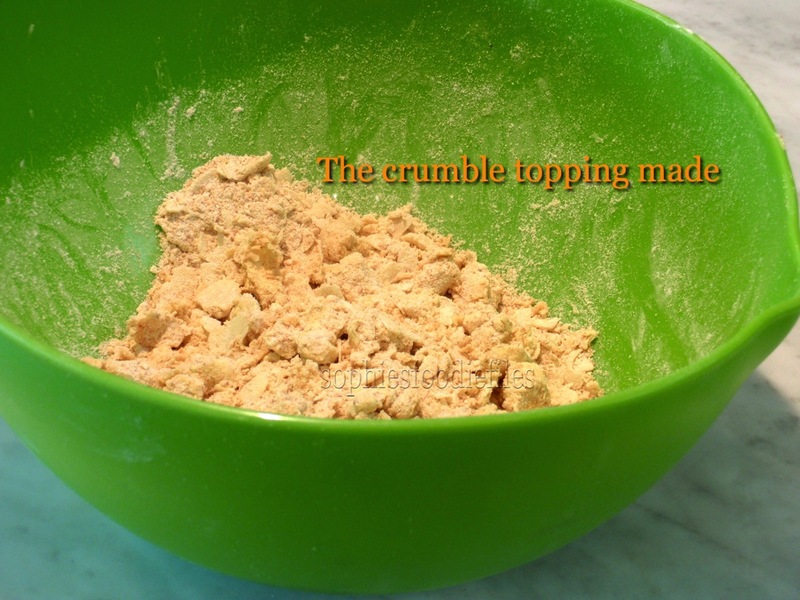 Top with your lovely crumble topping & divide it all evenly over the surface of the filling. Place into the hot oven for about 17 minutes, or until your crumble topping is golden brown & cooked. Take out of the oven & leave to rest it for a few minutes before indulging. Take your custard out of its package & whisk it through with a smaller whisk. Scoop a big part onto a lovely dessert plate & spoon your lovely cold custard besides it. Indulge with a loved one! 😉 Yummmmmmmm! 🙂 ♥ Stay Tuned & subscribe by email! Join 1,800 email subscribers now!!! It is free!!!! Click the link here below to subscribe!!! 75 gr speculaas cookies ( biscoff), crumbled up into bigger & smaller pieces. 1. Make your crumble topping first. Take a medium bowl & ad spelt flour & coconut sugar together. Mix well with a spoon. Now, add knobs of vegan butter & the crumbled speculaas cookies. With clean hands, mingle everything together until it looks like smaller & bigger bread crumbs! see picture! Set aside. 2. Preheat your oven to 200°C ( 400 F ) for about 10 minutes. Now, make the filling! 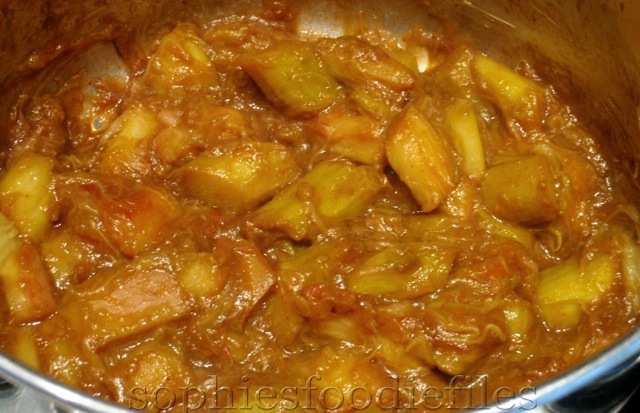 In a medium cooking pot, add rhubarb pieces, ginger powder, cinnamon, coconut sugar & water. Mix well on low-heat until it all caramelizes & until your rhubarb is starting to soften a bit. This will be after 5 minutes or so. Turn heat off & set aside. In that same pot, add cut up strawberries & mingle together well. Try not to damage the strawberries. 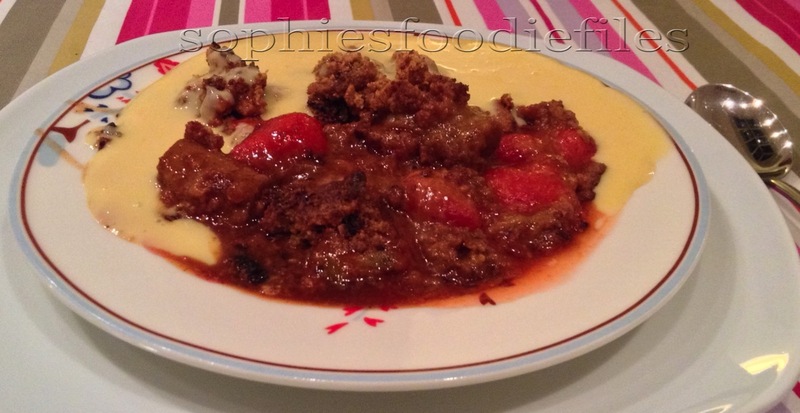 Place this mix into a fitted oven dish & crumble your topping on top, evenly divided. Place into the hot oven & bake for about 20 minutes. After 13 minutes, I turned the oven temp lower on 175° C ( 350 F) ! Because the coconut sugar & speculaas cookies will caramelize & the crumble topping will be darker in color than normal white sugar. So, check often! You don’t want it to burn! 😉 !!! 3. After 17-20 minutes of baking, the filling will be bubbling & check with a fork to see if your rhubarb has been cooked through. My crumble was ready after 17 minutes of baking! Turn oven off & take crumble out of the oven to cool off for 5 minutes. Take lovely dessert plates & scoop a big piece of your lovely crumble with the juices on your dessert plate! 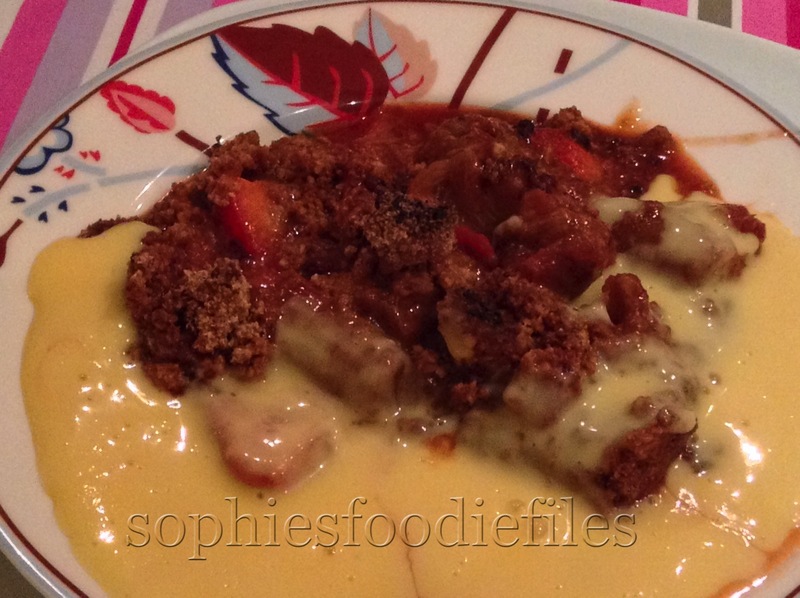 Pour some of your hot custard besides it so that it ends up near & over your crumble like picture above! 🙂 When you serve this rhubarb strawberry crumble, you surely need this hot custard alongside it! Peter, my parents & I can’t eat rhubarb crumble without it! 😉 MMM! first rhubarb from the garden! Today, I made this glorious winning vegan spelt gingered fig crumble! Again, I had a lot of figs from my own fig tree! 1. Preheat your oven to 200°C ( 350 F ) for 10 minutes. I always use a fan oven. 2. Take a large bowl & ad fig wedges. Scatter your ginger powder & your coconut sugar all over the figs. Mix well with a spoon so that the figs are covered with ginger & coconut sugar. Set aside. 4. Now, divide your filling between 2 cool oven dishes or put it all into 1 larger oven dish. You will see now that the coconut sugar has melted into the figs,..it will be yum yum,..later! 🙂 Now, divide your crumble topping all over the figs, so that they are completely covered! Bake in the lower section of your oven for 20 minutes. Check them often , to see if you must lower your heat. Mines were done after 20 minutes in the preheated oven. Turn oven off & carefully with oven gloves remove them from the oven. Let them cool for about 5 minutes before savoring them! My hubby & I split a large oven between us. We served it with hot vegan pouring custard! Enjoy it twice! 😉 MMM,…You will love it too! x Stay tuned, Subscribe through the photo link below to get my new cool newsletters aka posts! Join 1,800 email Subscribers! It is free! Click onto this link below! 2. 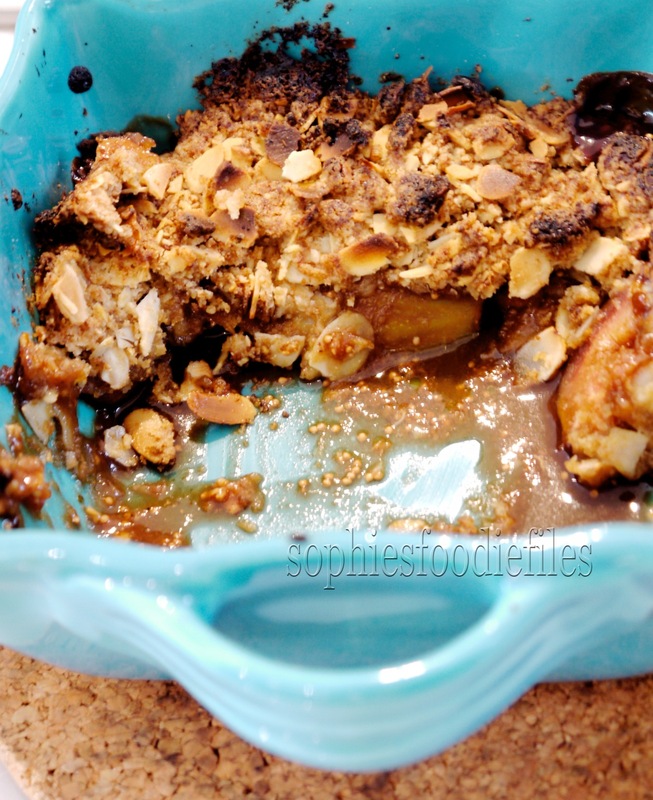 Sophie’s spiced rhubarb & pear coconut crumble! 3. 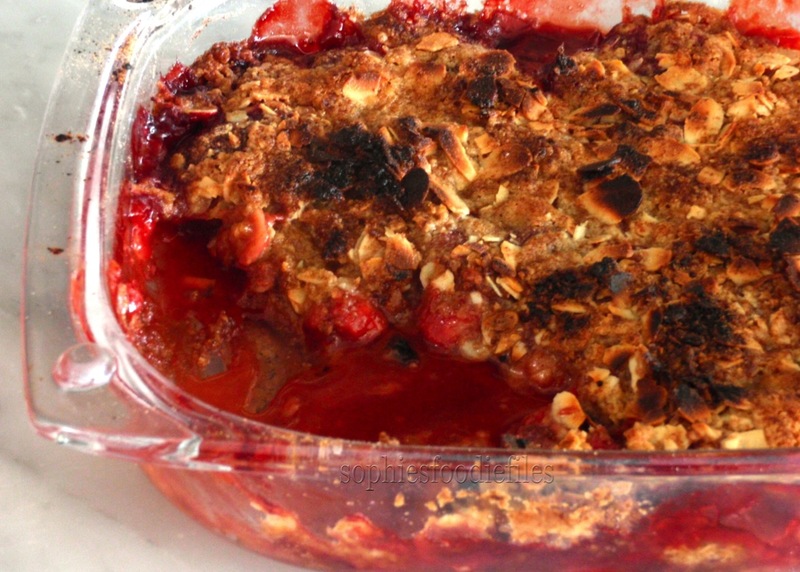 Gluten-Free & Dairy-Free strawberry rhubarb crumble! 4. Sophie’s orange, rhubarb & ginger crumble! Vegan gingery mixed berry crumble! Because it is the end of the Summer’s bounty & I had foraged a lot of wild blackberries, I had to make this most lovely crumble recipe! A mix of berries with a hint of orange, stem ginger pieces and a topping of deliciousness! 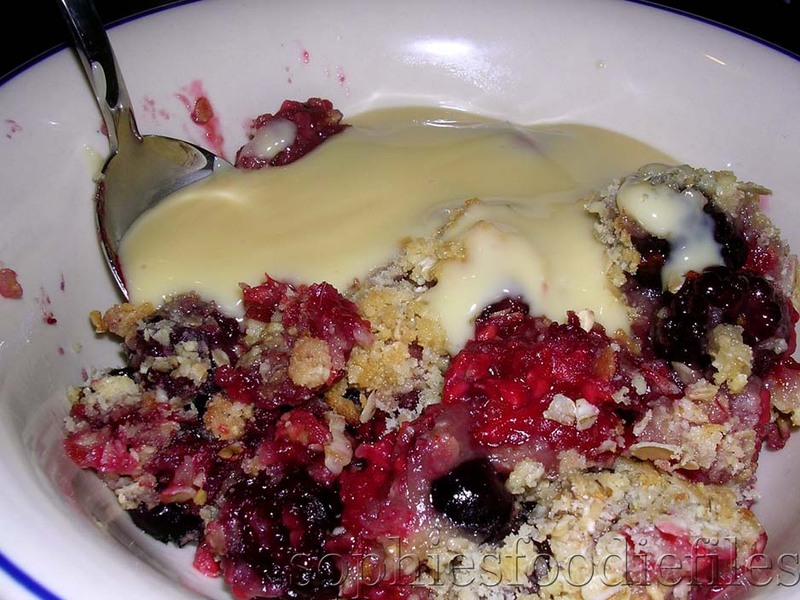 This lovely crumble is so easy to make & so easy to devour too! 😉 Check it all out!! 1. Preheat your oven to 180°C ( 350 F ) for 10 minutes. 2. Make the topping first. Take a large bowl & ad flour in it. Now, Add the butter & rub it into the flour. Add oat flakes, flaked almonds & coconut sugar. Mix gentle & do not overmix. It has to look like smaller crumbles. 3. In another bowl, add berries, mix them together with the orange zest, coconut sugar, stem ginger syrup & cut up stem ginger. Mix well. Take a fitted oven dish & place your fruit mix, in 1 layer, all in it. Now, scatter your crumble mix all over it & bake into the preheated oven for about 20 to 25 minutes until the crumble is golden brown on top. 4. Serve into 2 bowls & enjoy with some hot vegan pouring custard,…Yummmm! Enjoy, my lovely ones! 😉 ♥ Stay Tuned & subscribe by email! Join 1,800 email subscribers now!!! It is free!!!! Click the link here below to subscribe!!! 1. 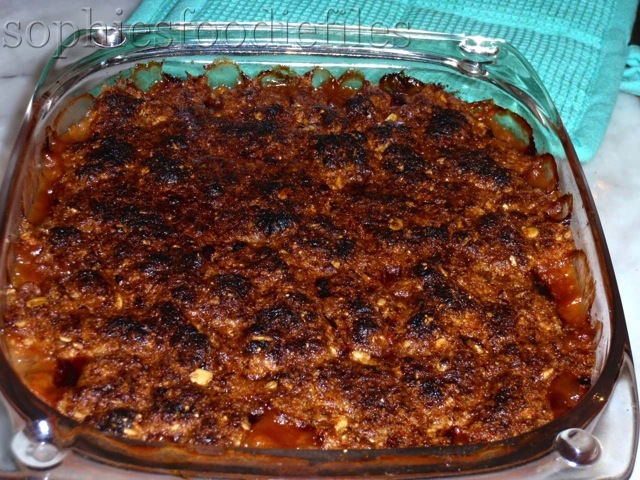 Tripe coconut rhubarb crumble, Vegan & Gluten-Free! 2. 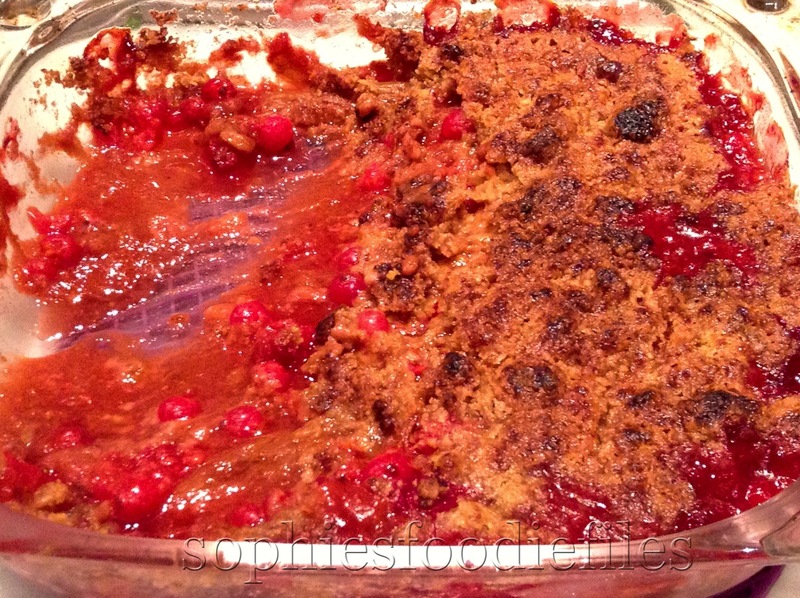 Strawberry & rhubarb crumble, Vegan & Gluten-free! 3. Spiced rhubarb & pear coconut crumble, Vegan! 3. 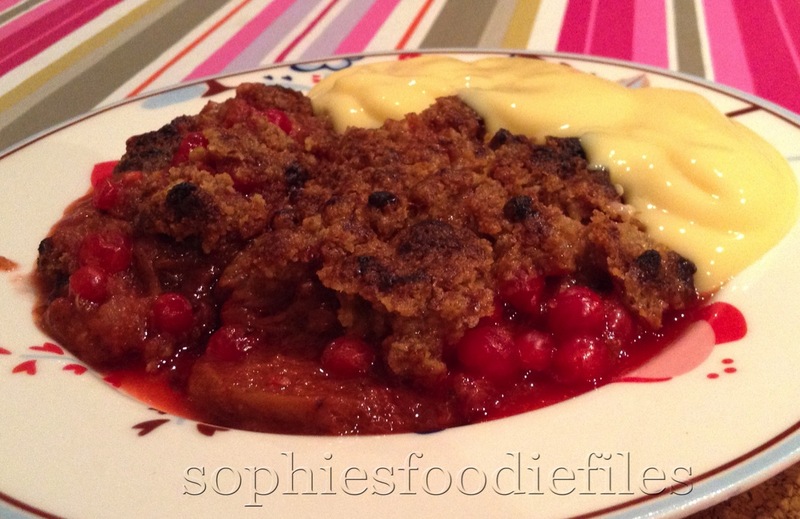 Sophie’s orange, ginger & rhubarb crumble, served with hot Devon custard! 4. 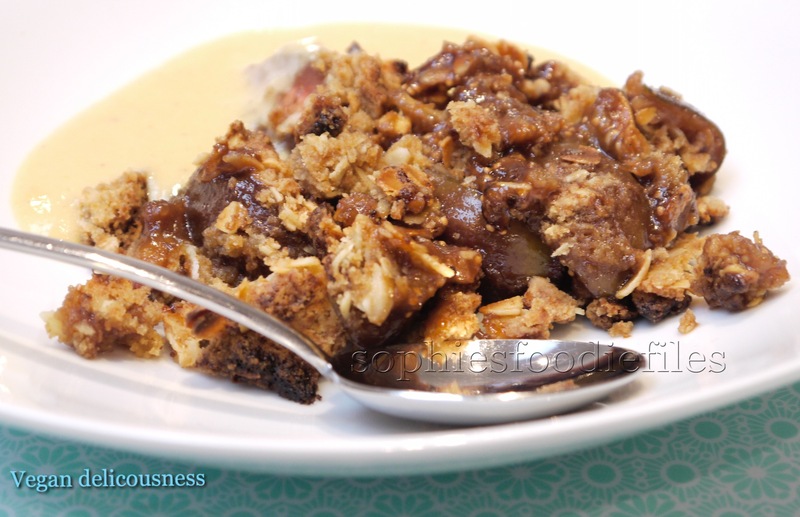 Vegan rhubarb, pear chocolate chip crumbles!